Each year, millions of people participate in races and sporting events, and when crowds blast into action, so can problems. Race Guards participate in running, biking, and swimming events, and when help is needed, we rush to the rescue. And as our partner, you are making the difference at that very moment! 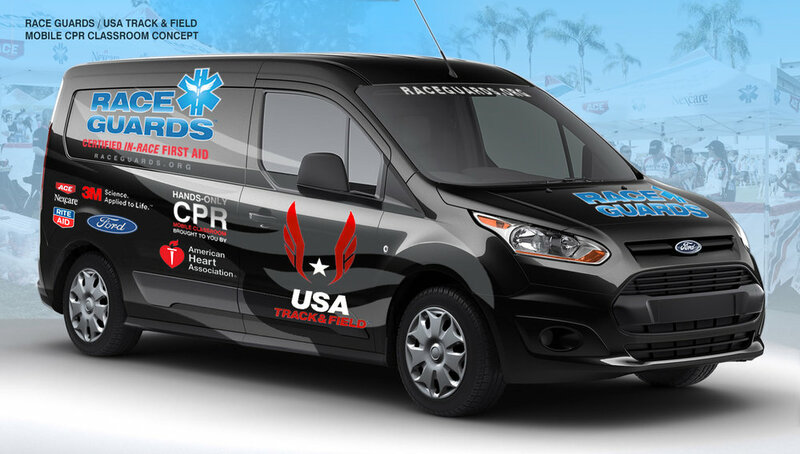 Your brand, your cause and your message will be featured on Race Guards marketing materials including jerseys, hats, visors, jackets, expo booths, print materials, online advertising, social media, and more, demonstrating your commitment to safety and well-being. It's a high-profile win-win for you as a partner and to our non-profit program. When you see Race Guards at events, keep in mind that all are selfless, dedicated volunteers! Rather than simply race for their own enjoyment, they keep an eye out for participants who might be struggling or injured. Their support is vital to those who need help finishing their race. And your support is vital to support them in their efforts to help participating athletes! Your name and logo featured on Race Guards materials, including marketing materials, website and banners. Get you brand in front of the crowds and help make a difference to any athlete on the course. We look forward to hearing from you and to engaging in further dialogue to discuss an impactful sponsorship opportunity for 2018 and beyond.